These wood destroying insects can be extremely harmful to any wooden surfaces in and around your property. 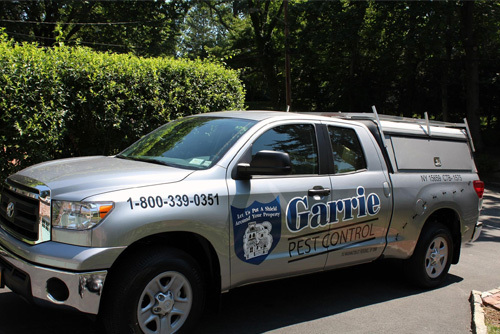 Let Garrie Pest Control provide you a free estimate for termite control services that we offer! Protect your investment and you homes by allowing our highly trained and professional technicians can provide you with the most important information regarding proper treatments and education regarding termite activity. Description: Workers and queens are both reddish to black in color. Workers are wingless and 1/8'' to 1/2'' in length, whereas the queens are a bit larger with wings. Queens will lose their wings after mating with the males. Habits: Their colonies have from thousands to 15,000 workers. They feed on human food. They are capable of destroying wooden structures and furniture. 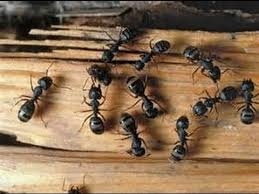 These ants do not gain nutrition from wood, rather they destroy it to make a nest. Treatment: Based on finding the source and their nest. Removing moisture elimination, removing debris and mechanical alterations. Carpenter ant control can be difficult, thus requiring integrated management. Description:12mm to 25mm in length, they have bare shinny black abdomens. Males and females are differentiated by males having a bright yellow spot in the middle of their heads. Whereas females can sting if disturbed or threatened, males are aggressive but lack a stinger thus making them harmless. Habits: They are not social insects like yellow jackets or honey bees. These bees bore holes into wooden structures about 9mm in diameter to 6in deep into the structure initially but with extended use these tunnels can become up to 10ft long . They also prefer soft woods like cedar or white pine for nesting and raising their young. Treatment: Infested would should be removed and replaced with preservative-treated wood. 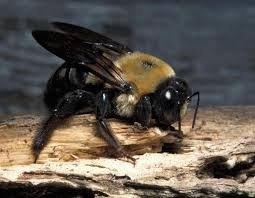 Painted wood discourages these bees from boring into it. Untreated wood can be protected through the use of formulations. Different pesticides should be sprayed directly into the tunnels and left untouched for several days before filling the holes. Description: Range in size from 0.8mm to 9.5mm, the typical size of beetles who infest structures are 3mm to 6mm in size. The species ranges from red-brown to gray-brown in color. Their body shapes are varied, but the majority of the species is cyndrical and elongated with a round head. Habits: Commonly infest seasoned wood. 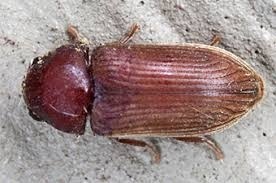 These beetles typically infest home structures, timber, cabinets and other furniture. They tend to re-infest and the females lay their eggs in the wood. Adults holes range from 1.5mm to 3mm in diameter. Treatment: First begins with determination of an active infestation. Infestations can usually go unnoticed until the large round holes begin to appear in the wood surfaces from the adults. Infested wood can be removed and replaced with treated wood, reducing wood moisture and utilizing aerosol treatment in the holes are all forms of treatment. Description: Social insects that live in large colonies. There are different classes that include: workers, soldiers and reproductive swarmers. 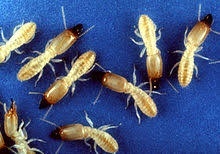 The workers have white bodies, wingless, and are about 9mm to 12mm in length. The soldiers have yellow to orange bodies, wingless and about 9mm to 12mm in length. The soldiers have large jaws which lack teeth. The reproductives or swarmers are dark brown to back in color with brownish to grey wings. The swarmers are about 9mm in length. 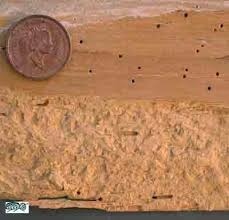 Habits: Colonies are located in the soil, where the workers create mud tubes to wood structures in order to feed. Their colonies are almost always connected to soil or some type of moisture source. Swarms typically occur in the spring and the morning after a warm rain. The workers are the ones who feed off wood surfaces. When the workers mature, they take over expanding the colonies and feeding reproductives. Soldiers are produced as the colony increases, and serve the purpose of forcing invaders, such as ants, away from the colonies. Treatment: The presence of a swarm or wood damage is a very good sign that there is a well established colony in the home or in the close vicinity. Termite control includes a thorough inspection of the property to determine the extent of the infestations, points of entry, moisture problems and then a determination of treatment options. Fun Fact: The wings of the swarmers are broken off after swarming.